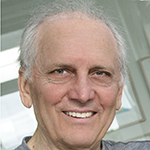 Professor George Paxinos is a major contributor to the Centre’s Brain Systems and Neural Circuits themes; he is the principal person investigating similarities and differences between brain structures in animals and humans. Professor Paxinos has vast experience in the field of brain anatomy and in developing databases for integration of multiple streams of neuroanatomical data. He is a conjoint professor of psychology and medical sciences at the University of New South Wales, Sydney, and an NHMRC Australia Fellow at Neuroscience Research Australia (NeuRA).